Could the London Zoo Tiger Death Have Been Avoided? LONDON — Staff members at London Zoo were “heartbroken” after a high-risk matchmaking operation involving two rare Sumatran tigers went horribly wrong on Friday. The male’s deadly mauling of the female tiger soon after they met drew an outpouring of reactions on social media. But one question was paramount: Could the tragedy have been avoided? The animals had been paired as possible mates as part of a European-wide conservation effort for the critically endangered subspecies. Asim — age 7 confident, handsome, playful — had been shipped in from Demark to meet Melati, a fellow Sumatran who had lived for years at the renowned zoo in Regent’s Park in Central London. He courted her for 10 days in a separate enclosure, the zoo said — “chuffing” at her and getting used to her sight and scent. Then he finally approached her. Melati, who had raised five cubs with another tiger, never survived the encounter. She died at 10 years old. Was it too soon for the two wildcats to meet? Why didn’t keepers use tranquilizers when the encounter turned violent? And why not use other methods, such as reproductive biotechnologies, to try to increase the population of a subspecies whose numbers have shrunk in the wild? The zoo said in a statement on Friday that it had taken every precaution before the pairing, and that experts had judged the time right for the introduction. Staff members also tried to save Melati when things turned aggressive, the zoo said, but it was too late. “Zoo staff immediately implemented their prepared response, using loud noises, flares and alarms to try and distract the pair, but Asim had already overpowered Melati,” the statement said. Some came to the zoo’s defense. Others questioned if a safer method to help Melati produce more cubs could have been used. “Wouldn’t artificial insemination have been the safer way to go?” Barbara Gould Stringer wrote on Facebook. Rebecca Blanchard, a spokeswoman for the Zoological Society of London, which manages London Zoo, said in an email on Sunday that the vets at the zoo had pioneered artificial insemination for its animals a decade ago, when traditional mating had not been successful for a pair of tigers. Artificial insemination, the process of collecting sperm from a male animal and manually depositing it into a female’s reproductive tract, has been used successfully before to facilitate the reproduction of endangered tiger species. In the United States, there have been three known tiger pregnancies from artificial insemination in the past 20 years, according to the Minnesota Zoo, which coordinates a Tiger Species Survival Plan. But the success rate has been low so far. “The limited contribution of fertility preservation techniques to species conservation principally stems from the lack of knowledge of species biology, as well as inadequate facilities, space, expertise and funding needed for their successful application,” Pierre Comizzoli, a research biologist at the Smithsonian Conservation Biology Institute, wrote in a paper published in January 2015. Mr. Comizzoli argued that, before developing assisted reproductive techniques, knowledge of reproductive traits is first needed. “Unfortunately, we know very little about species biology (reproduction in only 250 species has been properly described),” he wrote. 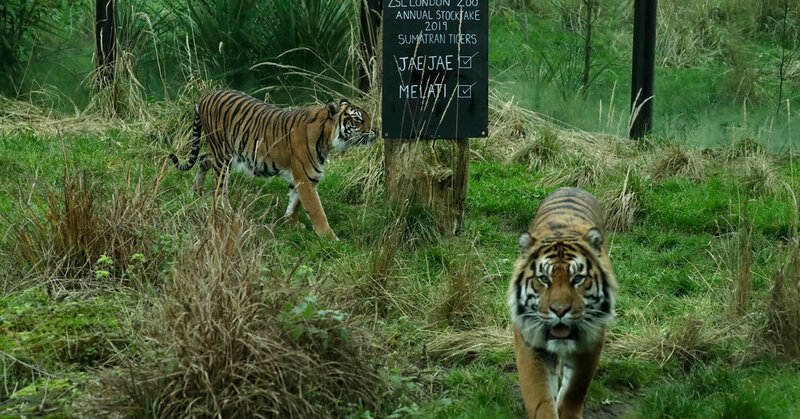 In fact, Melati mated with another Sumatran tiger, Jae Jae, in 2013, 2014 and 2016 to produce her cubs. But Jae Jae was recently moved to Le Parc des Félins, a zoo southeast of Paris, in order to start a new family. “The European breeding program takes lots of factors into consideration — including parentage and history, to generate the most genetically diverse population possible,” Ms. Blanchard wrote. Sumatran tigers are the smallest surviving tiger subspecies. Known scientifically as Panthera tigris sumatrae, they weigh 165 to 380 pounds, are distinguished by their orange coats and black stripes and can be found in the wild only on Sumatra, an Indonesian island. There are fewer than 400 of the rare tigers left, according to World Wildlife Fund, an international nongovernmental organization. The animals’ low numbers render their reproduction critical for their survival. It is still not clear why Asim attacked, and many are mourning the loss of a treasured animal. The zoo said that Asim had sustained a “minor injury” from the attack Friday and was being treated by vets. It is also unclear if London Zoo will use him to mate again.